1. 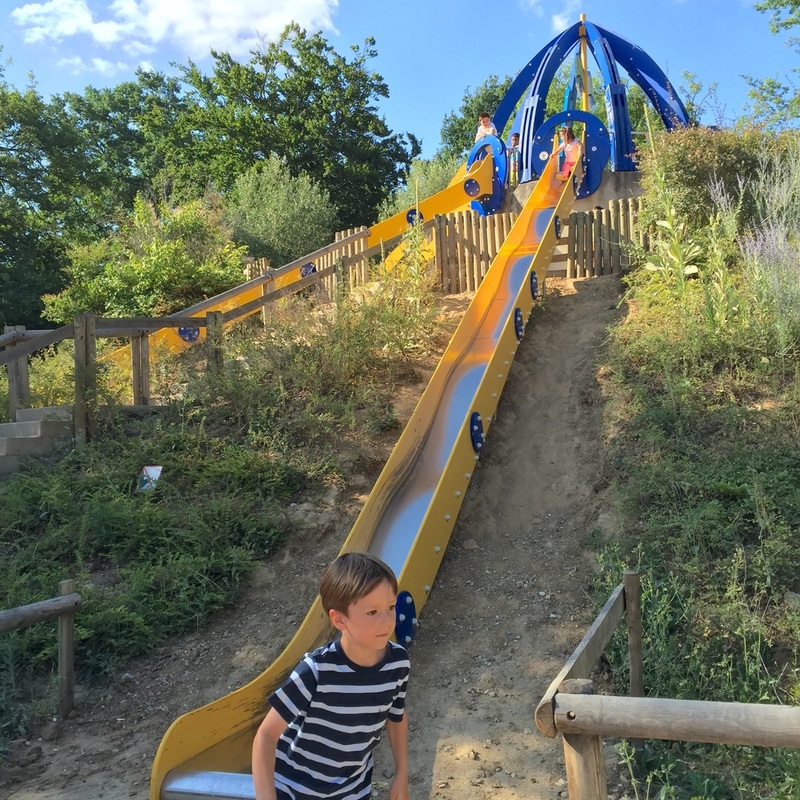 Jardin d'Acclimatation: This is a child-oriented park just west of Paris near the Bois de Boulogne (in Neuilly-Sur-Seine, but still accessible by Metro) with playgrounds, quality amusement rides, a water play area, puppet shows, aviaries, the impressive Loius Vuitton Foundation, and a small passenger train. Definitely a great place to spend a day as a family! I hope to write more about this park in a future post. 2. Jardin des Plantes: In addition to the flower gardens and greenhouses, we visited la Ménagerie (the world's second oldest zoo) & La Grand Galerie de l'Evolution (a breathtaking collection of taxidermy animals) at the Jardin des Plantes. There's a really neat carousel there as well. You'll find photos and more details in this previous blog post. 3. Parc Floral: On the eastern edge of Paris in the Parc de Vincennes, this park is a lovely place to spend a summer afternoon. There are four-person bikes to rent, a zip line, a ropes course in the trees, a large octopus sculpture with multiple long slides, puppet shows, and more. We enjoyed the live music here as part of the summer jazz festival (though it was rock music, strangely enough). 4. Eiffel Tower, Champ de Mars, & Trocadero fountain: We chose not to ascend the Eiffel Tower on this trip (long lines for the elevators or lots of stairs--purchase your ticket online in advance if you plan to go up), but we enjoyed walking beneath it. (It's always bigger and more impressive than I recall.) There's a sweet little playground near the Champs de Mars to the east of the tower, and carousels both at the tower and across the street at Trocadero. One of my favorite Paris moments was watching my children swim in the basin beneath the Trocadero fountains. A sign says it's forbidden, but the patrolling police don't seem to mind. The water is about three feet deep and quite cold, but swimming in front of the Eiffel Tower with French children and foreigners alike is an opportunity not to pass up! 5. Cité des Enfants at Parc de la Villette: Cité des Enfants is essentially a children's play museum similar to our Portland Children's Museum back home in Oregon. Our kids truly enjoyed it, but parents may grow bored in this particular area of the park. 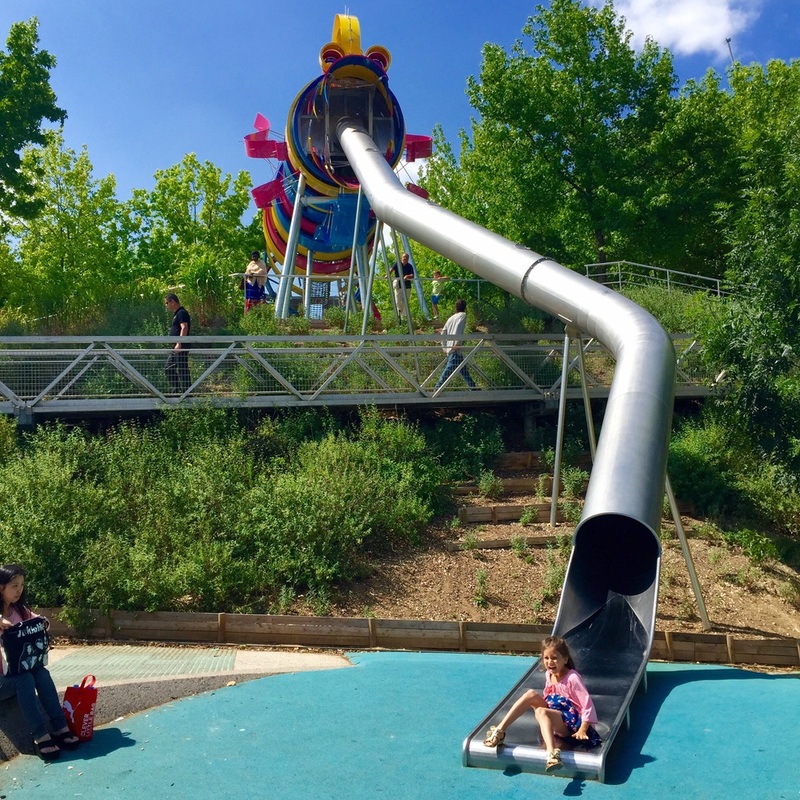 A highlight at Parc de la Villette is the enormous dragon slide. Technically it's for ages 7-14, but our three-year-old loved it as much as our six-year-old. There's also an IMAX theater In the Géode and a French submarine to tour. 6. Jardin de Luxembourg: Located close-in in Paris, this park is the classic Parisian children's park. We enjoyed the live music (on Bastille Day) and the kids loved the extensive play area, the well-done puppet show, and the small merry-go-round. 7. le Centquatre: This is a cool community arts center in the 19th arrondissement. A popular neighborhood hangout, Le Centquatre feels like the heartbeat of the neighborhood with its huge dance space, playroom for preschool children, and family-friendly expositions. We enjoyed watching flamenco dancers, breakdancers, and a guy learning to maneuver inside a large rolling hoop. I hope to write about this fascinating place in a future post. 8. 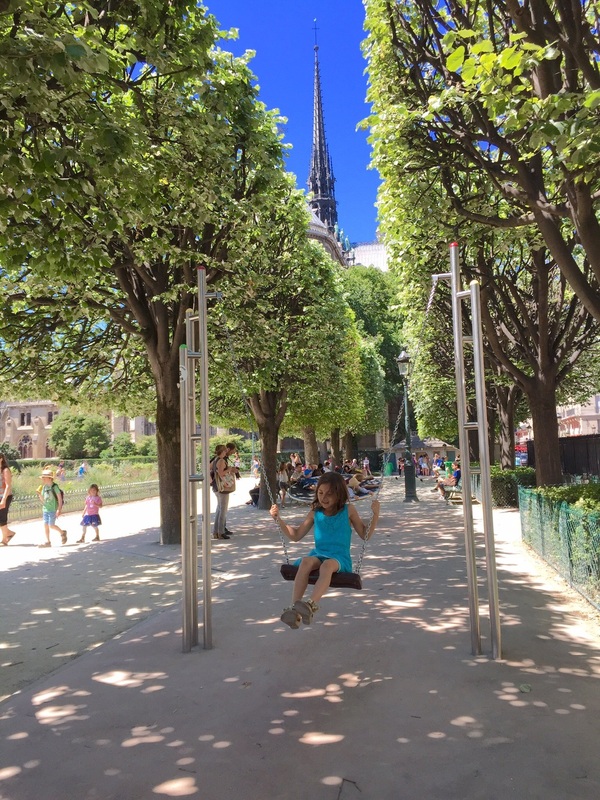 Notre Dame de Paris & Île Saint Louis: Your kids won't want to wait in the long summer lines to tour Notre Dame, but they'll probably be happy to play in the graveled park behind the church. There's a simple playground with a swing and a tilted revolving disk, but these two structures alone kept our kids busy for a good half hour or more. From there you can walk across the street to Pont de l'Archeveche with its love locks, or cross to Île Saint Louis for ice cream made by famed glacier Berthillon. 9. Shakespeare & Co bookstore, the Latin Quarter, and Gibert Jeune bookstore: From Notre Dame, it's easy to walk across the street to the English bookstore Shakespeare & Co. It's true that you can find English books back home, but this historic little bookshop is filled with only the best choices, and there's a sweet little children's reading nook upstairs where music floats in from the piano in the room next door. After we visited Notre Dame & Shakespeare & Co, we enjoyed Greek gyros in the Latin Quarter before picking up some gently used French children's books at Gilbert Jeune's Jeunesse bookstore. 10. Musée du Louvre and Jardin des Tuileries: The Louvre is the world's most visited museum, but for good reason. If you plan your visit well and keep the visit short, it's enjoyable and enlightening for children. We enjoyed unwinding in the Jardin des Tuileries afterwards, with its trampolines, carousel, playground, toy sailboats, and summer carnaval. I gave tips for visiting these places in this blog post. 11.Musée Picasso: We stayed in the Marais area, so we were easily able to visit this museum of Picasso's paintings and sculptures housed in a lovely hôtel particulier (private mansion). Kids and adults alike find his artwork amusing and creative. Before or afterwards, head to nearby Café Breizh for some of the best authentic Breton crêpes in Paris (but you'll need reservations on weekends). We hadn't made reservations, so we headed south for falafel from L'As du Falafel (the most delicious vegetarian meal my husband has ever had) and crêpes from la Droguerie--both on the Rue des Rosiers. 12. Centre Pompidou and Stravinsky Fountain: We didn't actually go inside this modern art museum because we were en route to a picnic at Jardin Nelson Mandela (mentioned below), but our kids really loved seeing the colorful building and the animated spraying fountains next door. 13. Musée de la Poupée and Anne Frank Square: My six-year-old daughter and I went to this small doll museum near the Centre Pompidou, and my daughter especially enjoyed it thanks to a French search-and-find game that we were given at the ticket counter. (I think it's available in English too.) Next door, the Square Anne Frank has a playground and benches to enjoy before you head home. 14. Les Halles, Jardin Nelson Mandela, & Église Saint Eustache: Forum Les Halles is actually an underground shopping mall--not a good destination for kids, and particularly not this year because there's construction going on until May 2016, but just to the right of it in the Jardin Nelson Mandela has a large outdoor playground where children can spend hours playing. The nearby Église Saint Eustache is an impressive 12th century cathedral worth touring, partially because it lacks the crowd that you'll find at Notre Dame. 15. Montmartre and Sacré Coeur Cathedral: Montmartre (essentially the Mount of the Martyr) can be a steep climb, but it's picturesque and there are several squares and small parks along the way. We went up after 7pm and there were still hundreds of tourists at Place du Teutre and Sacré Coeur. Nonetheless the cathedral is awe-inspiring and the atmosphere outside can be magical with the surreal view of Paris and the music of the street performers. 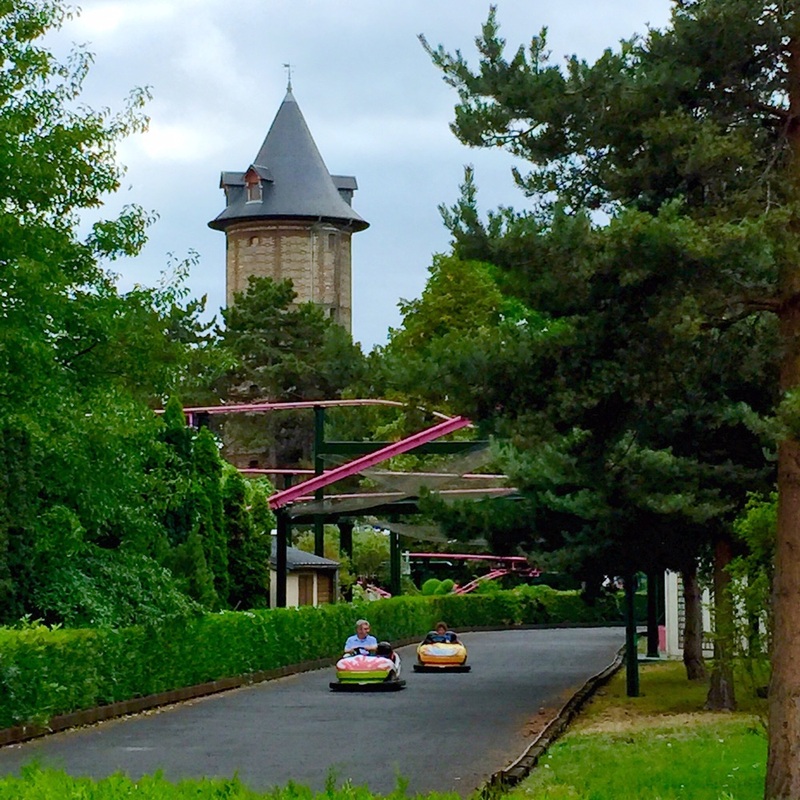 We also went to Versailles outside Paris, and while its worth seeing, I'd rank it low in terms of child-friendliness because even if you take the petit train around the gardens, there's still a ton of walking necessary and not much of it truly holds the interest of children. Marie Antoinette's petit hameau is the most intriguing stop for little ones (and equally charming for adults). Bring bread crumbs for the carp and ducks. Older children would enjoy a family bike ride anywhere in the Versailles gardens. If we'd had more time, we would have enjoyed vising the Musée d'Orsay, Parc des Buttes-Chaumont, or Parc Montsouris. I also want to tour the Opéra Garnier--especially after reading Benjamin Chaud's Une Chanson d'Ours (The Bear's Song) aloud to my children. What would be on you Paris must-do activity list? This post contains Amazon Affiliate links. Merci for reading and supporting Intentional Mama!